For the 2018 model year the Jeep Renegade delivers a great combination of off-road capability, open-air freedom, and convenience. The Renegade offers drivers impressive driving dynamics both on and off road. This is due to its nine-speed automatic transmission, which is a segment- first. New for this model year the Renegade gets some added standard features for the cabin. These include a 5-inch touchscreen and a six-speaker audio system. The Renegade also has upgraded 7- and 8.4-inch touch screens that include Android Auto and Apple CarPlay compatibility. Jeep put out a new version of their Uconnect infotainment system and this is found on the 2018 Renegade. What engines are available for this year's Jeep Renegade? There are two engine choices for the 2018 Renegade. Stranded on the sport and latitude models is a turbocharged 1.6-liter four-cylinder engine. This engine puts out 160 horsepower and 184 pound-feet of torque. The 1.6 liters is paired with a six-speed manual transmission. As an option, buyers of the lower two trim levels can get more power by selecting the available 2.4-liter four-cylinder engine. This engine will give you 180 hp, 175 lb-ft and uses a nine-speed automatic transmission. When you purchase the Limited model you will get the 2.4-liter engine as standard. The off-road worthy Trailhawk not only comes with 2.4-liter engine, it also adds off-road features such as 17-inch wheels with all-terrain tires, four-wheel drive with low-range settings, hill descent control, a raised suspension, tow hooks, underbody skid plates, and a full-size spare. What are some of the Renegade's top features? For the 2018 model year, buyers can select from four different trims. These include the base model which is called Sport, the mid-level model, named Latitude, and the top-of-the-line model, the Limited. For those who plan on taking their Renegade beyond the road, the Trailhawk model is ready to hit the trails. While the base trim comes well equipped each higher trim level will give you more standard technology and comfort features. The Renegade has room for five and offers plenty of legroom. In terms of cargo space, you will find 18.5 cubic feet of storage capacity behind the rear seats. When the rear seats are folded you will get 50 feet of cargo space. 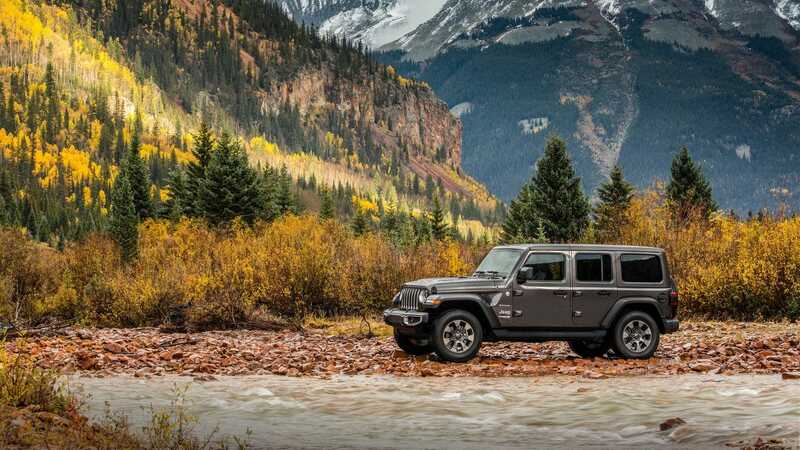 When it comes to exterior design the Renegade model is 100% jeep, yet it offers a modern look, with curved surfaces and black trim. Some of the features that come as standard on the 2018 Renegade include 16-inch steel wheels, remote locking and unlocking, push-button ignition, a rearview camera, a height-adjustable driver seat, a removable cargo floor panel, a tilt-and-telescoping steering wheel, a driver information display, a 5-inch touchscreen, and a six-speaker sound system with a USB port. One great feature that you can get for your Renegade is the My Sky open-air sunroof. It is a dual-pane power glass sunroof, that offers a power vent-and-slide front panel along with two large manually removable panels. What safety features will I find on this model? In terms of safety features, the Renegade comes standard with a nice list of modern technologies. In fact, there are up to 70 safety and security features on the Renegade, one of them being a segment first- Forward Collision Warning-Plus and LaneSense Departure Warning-Plus. New for the 2018 model year, all Renegades comes standard with a Parkview rear backup camera. The Jeep Renegade is unique in the subcompact crossover class in its ability to go beyond the road. It not only offers best-in-class off-road capability, open-air freedom, a segment-first nine-speed automatic transmission, but also impressive mileage and a long list of advanced safety technologies. If you are interested in learning about the 2018 Jeep Renegade give us a call or stop by the dealership today.